Morgan 41 OutIsland Ketch, "Mystic Courage". 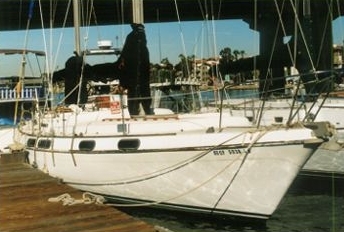 Excellent Price, Great Cruiser or Liveaboard, Long Beach California area, 50 hp Engine with 60 hours (value $10,000! ), sail and equipment inventory too long to list!. 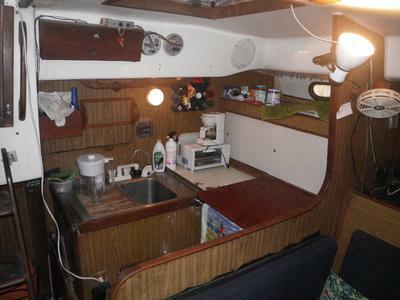 Boat is 1973 in good condition. "Mystic Courage" is the name, aka "O". Sailing this single-handed or with friends is fun, or set it up for a challenge! Setup for cutter rig, or mizzen staysail, huge spinnaker, storm jib ... whatever conditions are out there. Upwind, downwind, dockside or liveaboard you will enjoy this boat. Good sail inventory even includes cutter-staysail, massive spinnaker, storm jib, plus drogue, two spinnaker poles, 3 anchors, powerful anchor winch, many lifejackets, harnesses, and much more! You will want to take a look! 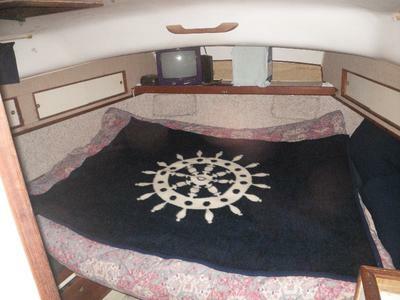 The Morgan 41 OutIsland Ketch is a shallow draft, very beamy (13ft 8in)stable sailer. Centre cockpit allows private aft stateroom with own head, with foreward stateroom, second head, and large center salon. Formerly a Navy training boat, it can sleep up to 9! Or, a great boat for liveaboard! Aft stateroom has been updated, salon and forward stateroom can use some TLC. The upper-lower hull joint has been re-sealed, as have all windows. Sails and rigging in good condition. Engine has only 60 hours - essentially new! Liferaft, inflatable, and outboard can be included, maybe even my classic longboard. This would be a great boat for a sailing club or ocean research organization, with lots of sleeping spaces, lifejackets and harnesses, two heads, an extra 100 gallon water tank forward, two large water and two large fuel tanks, a "near new" engine and aft cabin for instructor(s). It has a huge, light wind spinnaker, a 150 jib, a 100 jib and a storm jib. There is a staysail jib, or it can be rigged for a mizzen staysail. With so many combinations, it is a good training vessel. Being shallow draft, it can be taken into many bays, rivers and even streams other boats cannot get into. The engine room has an automatic "self-extinguishing" fire suppression system, and there are CO2 and dry chemical extinguishers in the main, forward and aft areas. It has a CNG stove, which can readily be adapted to propane with a different regulator and orifices in the burners. There are 3 anchors, a heavy plough with 300 feet of chain, a large Danforth with 100 feet of chain, and a medium Danforth. There is a single-side-band radio for time signals and communications and a VHF for local comm's. There is 20 mile radar and a 12volt, 120 volt portable sound system for below or on deck use. It comes with dishes, pots and pans, cutlery and linens. Ready to move aboard!